Katie and Rocky Fly To Colorado. 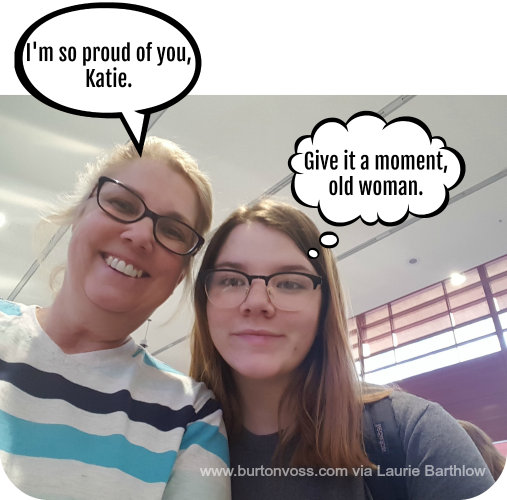 This week’s post is in the words of my Darling Daughter. She describes a bonding moment with her younger daughter during the McCarran International Airport screening process. So, Katie went to Denver yesterday for her annual visit with my brother’s family. Not surprisingly we were a little behind schedule at 5:00 a.m., and by the time I got a pass to go through security with her to catch her flight, we were running later still. I didn’t have anything to put through the scanner except my shoes and cell phone. Katie had her backpack and laptop which she took out and put it a separate bin as required. Shoes, phones, and the computer zipped down the rollers. Everything came through except Katie’s carry-on. We put our sandals back on and waited. I began to picture us in a lineup of Clark County’s banned flyers and asked Katie if she forgot and left her pocket knife in her backpack? 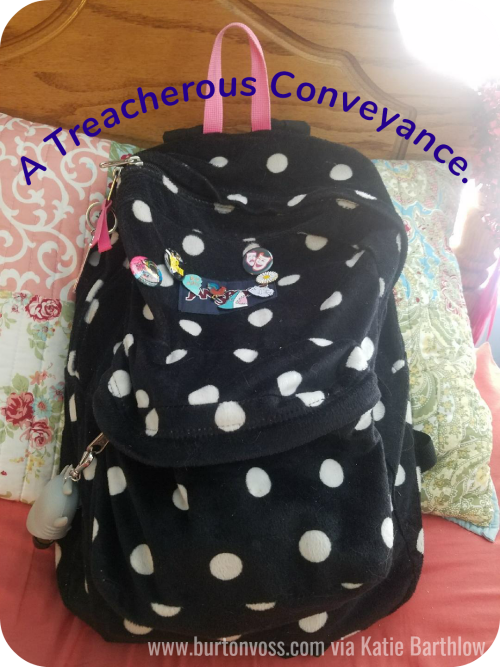 Finally, a security officer appeared holding the bin with Katie’s velvet, black and white, polka dotted backpack with the pink straps. All the little doodads and keychains she had attached to it were flapping over the sides clattering against the plastic. He looked us over, and the sight of him replaced glitzy neon lights to become my defining image of Las Vegas. We froze at the end of the conveyor, jostled and pushed by the other in-a-hurry passengers. We stood in their way and so close that they no longer smelled of perfume and aftershave but hurry, worry, and tension. The agent carried the tub to a small counter where he proceeded to inspect the object of our delay. He didn’t exactly motion us over, but Katie and I sidled up anyway and watched him poke, prod, pinch, and frisk the pack. All the while I ran through every possible thing Katie could have in it that would cause a problem. Oh, please don’t let her be trying to smuggle fireworks or pot (it’s legal in Colorado, you know). Well, apparently an airport security official does not need to be told by a rushed, middle-aged, mother that he can open a bag containing unknown and potentially hazardous or dangerous material or weaponry. 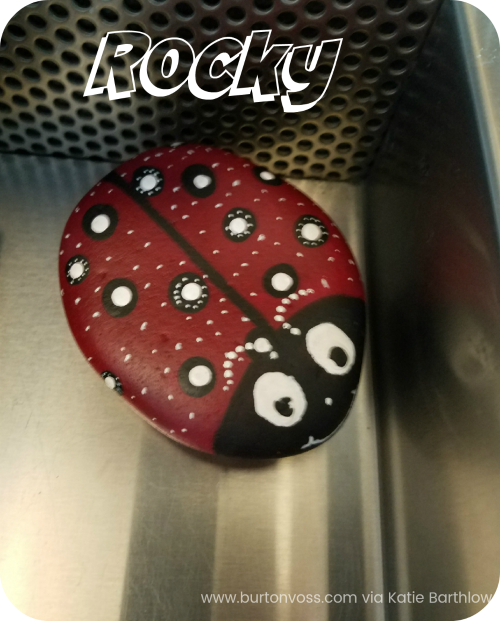 He finally landed on something, and I admit my heart rate jacked up a tad as he unzipped the front pocket and pulled out a large, brightly colored ROCK. So strong it can hold up an airplane. You see, my daughter has been caught up in the 2017 version of the pet rock craze. She spends a lot of time avoiding homework by painting the landscaping rocks from our front yard and hiding them around town. This activity apparently even has its own Facebook page. I assumed that our humorless security official was not familiar with this pastime, but would now have a pretty pink rock with the smiley words “Love from Kingman, Arizona” as a paper weight on his desk. I rather heatedly informed my daughter she would not be allowed to take that on the plane. Imagine my surprise when the officer wordlessly slipped the rock back into the front pocket and handed the bag to Katie. Once again, we made the gate with a microsecond left to board. I’ve watched my Darling Daughter dash from calamity to catasrophe all her life, usually with hilarious results. She needs to start her own stories. Before leaving, I had to wonder about the agents on their coffee break. Agent 1: I intercepted 5 ounces of cocaine this morning. Agent 2: I got 3 kilos of pot and a switchblade. Agent 3: I found a rock. Stunned silence – waiting for the punch line. Agent 3: They were checking in from Kingman, Arizona. Agent 2: Well, then … sure. What happened to you at the check in? Leave a comment here.